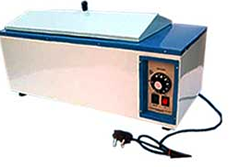 SGM serological water baths are widely used for day to day bacteriological and varied laboratory applications requiring incubation as well as general tests and procedures in variety of researches and testing laboratories including Wassermann, Kilmer tests. There are various salient features has been added to this product such as its Ergonomic Designs and Calibration and Protocol Documentation. SGM's product is very useful for versatile usage and thus provides more and long life to this instrument. Its unique features include higher energy efficient and very low on maintain maintenance.